meghan eats local: Epic Kale or Epic Fail? Raw kale has always made me a bit nervous, because apparently it’s difficult to digest. My stomach doesn’t need an excuse to be difficult, so usually I braise my kale or just stir fry it in olive oil it with other greens. But recently I heard through my friend Bonnie that our other friend Julie had an epic kale recipe. I’m not sure if she actually used the word “epic,” but I prefer that word to nearly every other adjective, so in my memory she used it. 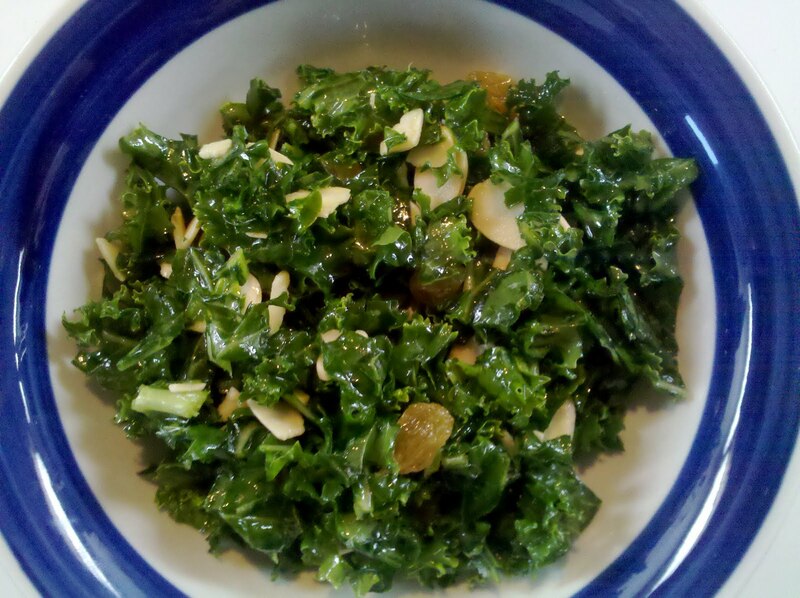 This epic kale recipe involved “massaging” raw kale. Obviously I was skeptical. What kind of person massages a leafy green vegetable? 2 bunches kale, stems and ribs removed, leaves very finely chopped. I didn't have any kale this week because our CSA membership is over for the season. My roommates have graduated and moved out and I’m only around for another week and a half, so it looks like I’ll be buying my veggies at a grocery store or a farmers market until I leave. For this recipe, I purchased a bag of washed kale from Trader Joe's. Let me tell you, this kale looked like it could use a massage. Especially after I chopped it up in little pieces. I didn’t have any lemon juice, so I massaged it with just the olive oil and salt. I imagined that to the kale, it felt like an exfoliating body scrub. When the kale was looking satisfied and relaxed, I added a “splash” of orange juice and a “drizzle” of agave syrup (which I was substituting for the honey). Whoever indicates that you should use a "splash" or a "drizzle" of something in a recipe obviously has never cooked with me. What do these measurements mean? I am so confused by them. I sighed and did taste tests of the kale (which, by the way, was positively glowing after its massage) until it tasted about right. I absolutely did not add the cayenne. I was already taking a risk by asking my stomach to digest raw kale – there was no way I was going to throw cayenne into the mix. I shared it with Amy and we both agreed: it was delicious! The combination of olive oil, orange juice, and salt made the salad taste fresh and summery. I waited a few hours to decide whether this recipe was epic kale or an epic fail - I wanted to give my stomach time to prove it could digest the raw kale. Then I forgot what I was waiting for because nothing happened. I am relieved it was epic kale and NOT epic fail! And glad the splash of OJ & drizzle of honey didn't throw you for a loop. I came up with those measurements all on my own!